Home Strategies Which Ecommerce Delivery Options Do Customers Want? 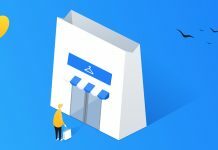 Which Ecommerce Delivery Options Do Customers Want? Delivery for online purchases has come a long way since the early days of ecommerce, with most sites offering a range of options to appeal to customers. As the ecommerce market has grown, customers’ expectations around service and price have increased. Indeed, a recent survey by Alix Partners found that expectations around shipping time are higher than ever, and that this is partly driven by Amazon Prime. Even when shipping is free, customers still expect relatively fast delivery, and Amazon Prime members even more so. It seems that the big ecommerce players like Amazon are driving customer expectations around delivery. Customers want free, but many are also prepared to pay more for speed and convenience, next day delivery or nominated time slots for example. According to stats from a recent UPS Pulse of the Online Shopper survey, 23% of orders placed online used two day shipping. The report also highlighted the importance of speed and convenience in shipping options. 30% of online orders are delivered to alternate locations. 63% say delivery speed is an important consideration when shopping online. 77% are willing to pay for expedited shipping. 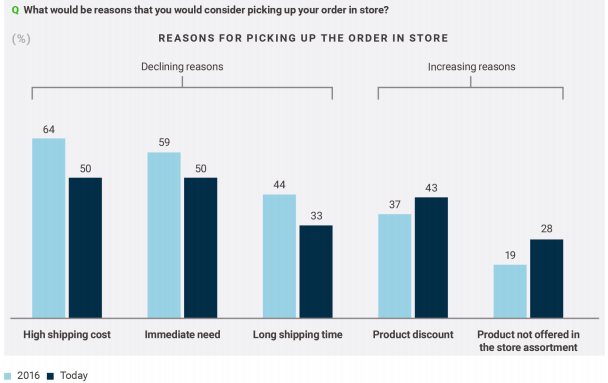 41% of shoppers have ordered items for same day delivery. 58% say the ability to view items available for same-day delivery is important when shopping online. Collect in-store services are also becoming more popular, and this is party driven by the desire for speed, as well as saving on costs. The biggest reasons were because customers had an immediate need, the desire to avoid shipping charges, and slow delivery. 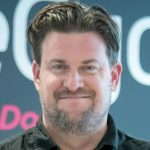 Which delivery options should retailers offer? Ideally, retailers would offer a broad range of options to appeal to as many customers as possible. For example, Schuh offers seven different options for shoppers, including free delivery, collect in store, ad delivery to local pick up points. 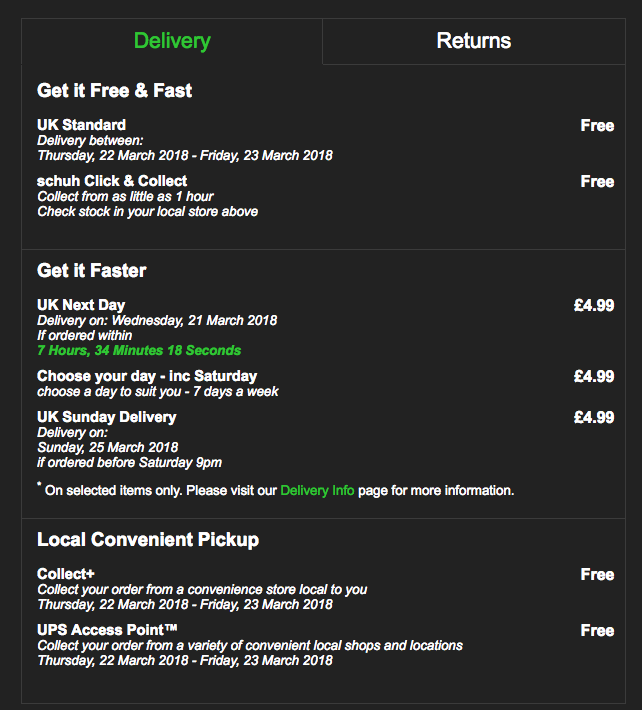 This list of shipping options should cover most customer preferences, and helps Schuh to convert more shoppers into customers. Offering all of these options may not be possible for all online retailers, but it makes sense to offer some choice. A basic free option is desirable given how much stock shoppers place on this, as well as a faster but more expensive option like next day delivery. Also, given the popularity of collect in store services, this will be an option that customers expect more and more. You don’t have to have a store network for this too. Amazon can compete through its network of lockers, while third party services like UPS Access Point can provide alternative pick up locations. 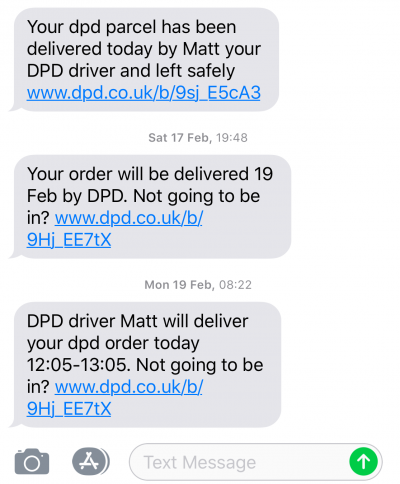 What does a good delivery experience look like? A choice of convenient, fast, or cheap shipping options is great, but you need to match customer expectations around performance. This can be tricky when dealing with third party couriers, traffic issues and weather problems, but it’s important to keep customers happy by delivering on time. There are also ways that retailers can improve the delivery experience for customers, even if they do encounter problems. Clear, accurate tracking online. This can save a lot of wasted time and frustration for customers. Many couriers will tell you that an order is out for delivery but tracking options that give detail like expected delivery times are much more useful. Proactive communication (text or email updates). SMS notifications can be great for this. For example, some couriers will update customers on expected delivery slots, or provide option to make adjustments. Good communication when problems occur. Every retailer will experience delivery issues now and then.The key is to communicate with customers and keep them up to date. Good support from the retailer. 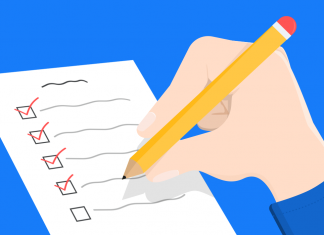 Though shipping problems can often be blamed on couriers, retailers need to take ownership of these issues, as customers will ultimately hold them responsible. It’s not enough to just palm customers off onto couriers. Thanks for the great article Graham. Customers are also expecting a quick & easy to use returns option as well.